Indonesia is a rich country of nature tourism, especially Ijen Crater that located at Banyuwangi regency, East Java Island of Indonesia. The wonderful things when You enjoy Ijen Crater tour is the existance of Blue Flame an active volcano that always belches huge of sulfuric smokes and included in a group of stratovolcanoes in East Java Island. Ijen Crater volcano located in the middle of Bondowoso and Banyuwangi regency exactly about 32 km to the north west of Banyuwangi regency. Ijen Crater, East Java has 2,368 meters high above sea level with 200 meters deep that contains about 36 million cubic of acid steam water. The principal attraction at Ijen Volcano East Java is the large of crater lake that has much sulfur and tobe one of the Sulfur mining resource in the world until tobe the site of a labor intensive sulfur mining operation. In which, sulfur-laden baskets are carried by sulfur miners from the Ijen crater floor by using an iron equipment like hammer and crowbar to cut some clods of sulfur into little piece and moved to the baskets have been provided before then brough to the Bundar post to weigh it and get it’s weight report in paper form afterwad. They brough it to the warehouse to earn salary. They bring loads of sulfur from the Ijen crater at least 60-80kg, maximum 100kg in each hauling, depend on their strength. Blue Flame Ijen Crater known as the most wonderful crater in East Java Indonesia. Mount Ijen is a natural process of Ijen Crater that occurred all nights begin at 18:00 PM and finish at 05:00 AM, Blue Flame always flame up from the rim seems like the gas stove flame with huge of flaming up about 600° celcius heat, seem very wonderful from the nearby place. Blue Flame is the result of the last eruption at 1990, eventually form unique and spectacular. To visit the Blue Flame Ijen Volcano East Java, need to start from the nearby Hotel of Ijen volcano at 00:30 AM early morning, or 01:00 AM by car or motorcycle then stop at paltuding (parking area), then start trekking to the top for 1 hour or 3 kilometers. Trekking tour package to the volcano rim, must using flashlight, trekking pole and mouth mask. Along the trekking from the top to the bottom crater is very recommended to use the local guide because the path condition is rocky and stony. you can also use the local guide from paltuding (parking area) until finish trekking because local guide not only accompany the trekking but also show the way to the top, help to take picture, give the high care and guide the visitors into the safty way with their instruction. 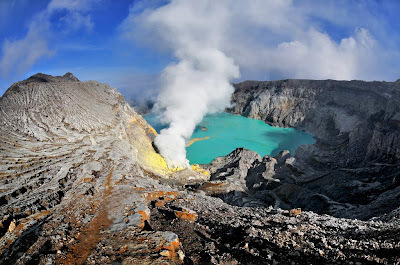 Ijen volcano is one of the nature attraction in Banyuwangi. Beside Ijen Crater East Java Island, Other interested place around Banyuwangi will easily find like Sukamade Beach tour, Plengkung Beach, Wau Dodol Beach, Green Bay Beach, Pulau Merah Beach and many more. The best time to enjoy Ijen volcano tour is on March - November, These months normally has clear views and good weather. The nearest way to enjoy Ijen Crater tour package is from Banyuwangi, and Bondowoso. From Banyuwangi Harbor or Hotel around Banyuwangi, and Bondowoso only need 2 hours driving by Car or motorbike, But If You start Your tour package from Surabaya, You can take the arrival time in the morning because from Surabaya is 7 hours driving. Other popular volcano that also popular in East Java is Mount Bromo located 6 hours from Banyuwangi and 3 hours from Surabaya. If You are interested to explore other East Java Island tour package, You can visit Our booking form.